Yeah, ok, whatever you say. I personally don't see it, but you're her momma!! Now that you aren't working at Steak and Shake, do you think you might just have a little too much time on your hands. Hey, just asking! think diesel is an illegitmate love child? 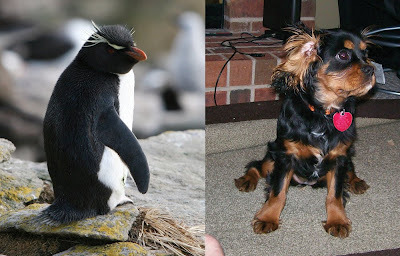 i think it would make a great love story...a bird may love a fish, but can a dog love a penguin? fated love. ah...so shakespear.